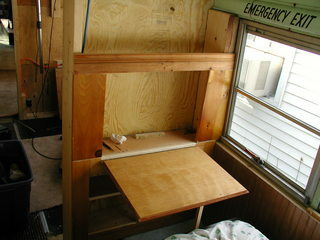 The partition at the front of the bedroom will contain a desk, closest, bookshelf, and several cupboards. I started from the bottom up, I didn't really have a plan other than knowing I wanted cupboards on the bottom, the desk, a bookshelf, and whatever might fit above that. I did have a set of doors that determined the size for each opening. The desk. Since I'm working with re-used material I don't have the luxury of having a lot of long pieces of wood so I split up the face frames such that they could be built from short bits. One of the great things about working with re-used and recycled materials is that the limitations placed on you by the materials often leads to details like the horizontal molding seen here. 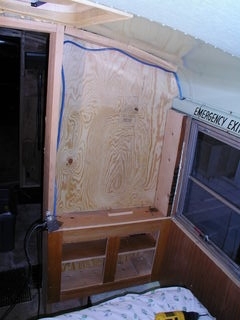 I salvaged the piano hinge for the desk from one of the "School Bus" sign doors that covered the upper "windows" on the front and back of the bus. 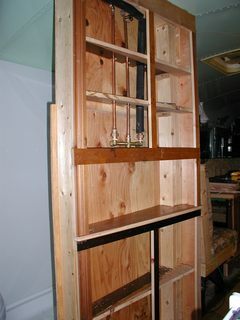 Here's the finished desk side, there are still two doors to install on the cupboard below. Here is the beginning of the closest. 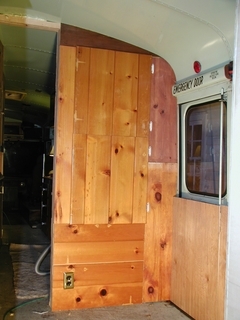 All of the woodwork in the bus will ultimately be painted with the exception of the vertical bead-board paneling on the sides. While I like the look of varnished wood, paint will work to unify the different colors and finishes of of the recycled pieces. The bedroom cabinetry mostly complete. I'm not sure what will go under the closet yet, perhaps a drawer. You can see I carried the molding feature across to the closet side, I think it will look nice painted a complimentary color. 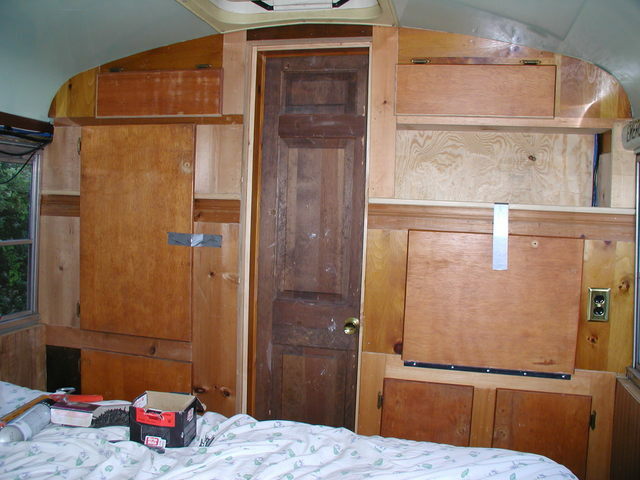 This is the broom closet in the partition at the forward end of the bunk room. It's only 3 1/2" deep but there are a lot of tall skinny things (like brooms and the wand for the vacuum) that will go in here. 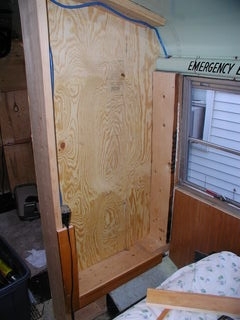 There will be two mini-van seats in front of this wall so the door is split, the bottom half will only open when the backs of the seats are folded flat. 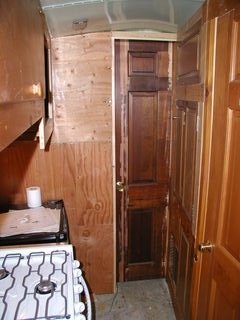 I sliced up and re-glued another 30" six paneled door to make an 18 1/2" wide 3-paneled door. 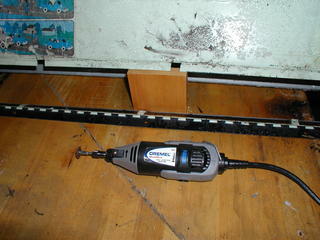 The cheap doweling jig I bought did a terrible job of lining up the slices so I had to plane the door some. 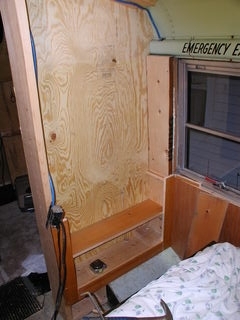 I built a shelf for the radio and trimmed out the front window. 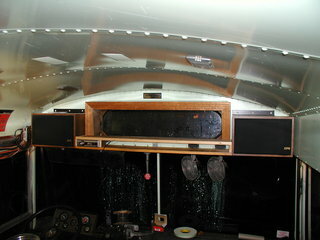 I had originally planned to use a household type stereo powered off of the inverter. However, I found that the household stereo did not do well while the vehicle was in motion and after a while developed some problems that I suspect were due to the modified-sine wave output of the inverter. 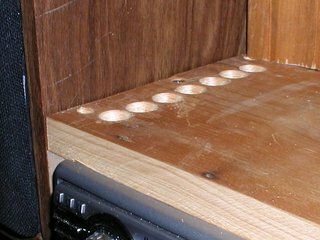 The radio had a heat sink along one side and I wanted to be sure there was sufficient cooling so I drilled a bunch of holes in the top and bottom shelves. The space next to the shower seemed an obvious place for the pantry. Since the dinette seat jutted out into the aisle a little I decided to make the pantry a trapezoidal shape to smooth the transition and so it could hold just a little more stuff. 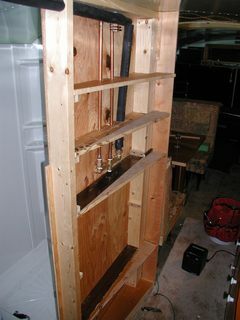 Step one was to make the shelves. I'm running a little low on wide boards right now so I built the shelves out of narrow scraps. This also made the construction a little easier as I was making one rectangle and one triangle per shelf. I hope that Saturday's trip to the dump will bring some new material. 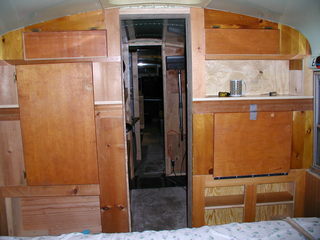 Next I built the face frames for the doors. 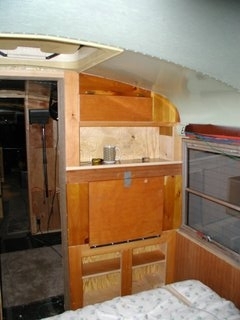 Here's the completed cabinet with the doors in place. 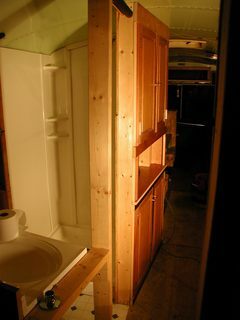 The finished bathroom wall and bathroom door. It's hard to get a good shot of this area without a wide-angle lens. 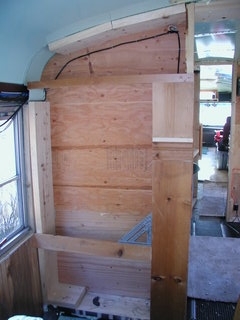 I'm quite pleased with the way building this wall out of kitchen cabinet doors has turned out. I can't wait to get a unifying coat of pant on. 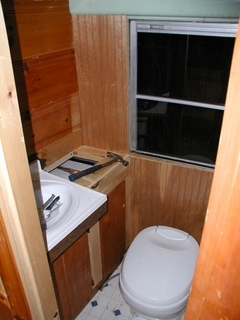 Here's the toilet in place, it's tight but with the shower stall right next to it there is enough space for comfort. The wall the sink is on is also angled to make the bathroom wider towards the door then it is at the back. 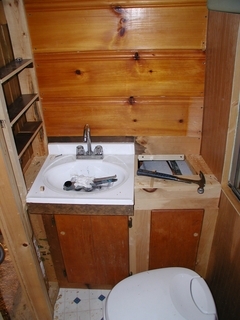 Here's a view of the bathroom from a slightly different angle, you can see that the front edge of the sink is also cantilevered out to make some room underneath it. 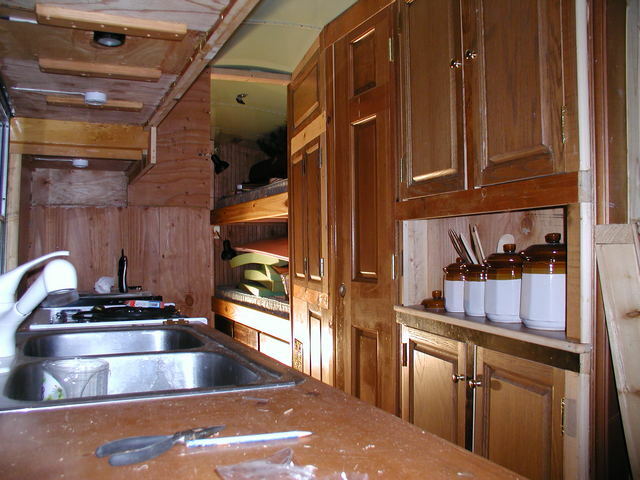 The doors under the sink open right and left and the panel at the back is held in place by an internal bungee cord. 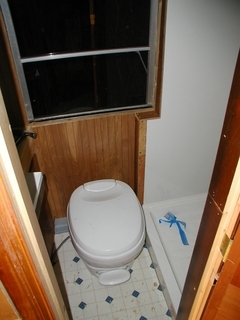 It's access to water heater connections and pump wiring. Here's a shot taken while standing in the shower. 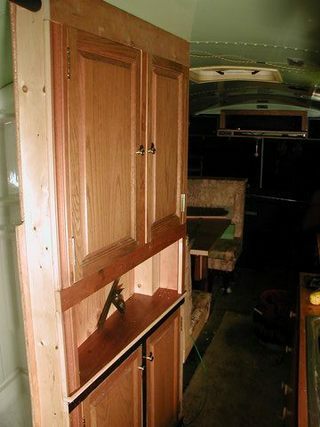 The shelves to the left are actually part of a hall cabinet, there will be more bead board paneling to the left of the sink and a medicine cabinet above it.